Our Superliner Bedroom is ideal for two passengers, but can accommodate three (two passengers must share the lower berth). Call 1-800-USA-RAIL for help reserving the Superliner Bedroom for three passengers. Each room has a large sofa with two individually reclining sections, and an easy chair. At night, the sofa converts to a comfortable bed, and an upper berth folds down from above. 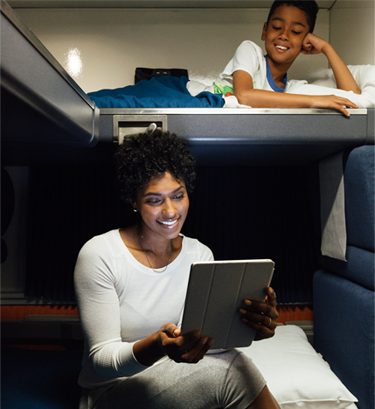 All Superliner Bedrooms feature private, self-enclosed restrooms with toilet, sink and shower. All Bedrooms are located on the upper level of our double-decker Superliner train cars. Upper Berth with ladder 2'4" x 6'2"